There's an old story that seems like it applies... "The Emperors New Clothes"
Many devices have higher amplification levels, special amplifier modes, different higher gain settings, etc. for hi-res output (e.g. qualcomm based: Xiaomis, asuses, etc.). Some devices (Samsungs) just output high ultrasound frequncies and nothing more - you can know it’s a hi-res only by frequency analysis. For BT it’s a bit different story as standard SBC is much lower quality vs ldac/hwa or aptx hd - that’s easily noticeable. you can know it’s a hi-res only by frequency analysis. I understand that there's hardware out there that supports Hi-Res. My contention is the reality that the people that say things like "a veil being lifted", "harshness totally gone", "unconstrained", "like the difference between night and day", etc are most likely experiencing expectation bias. If they actually did true A/B/X testing I would bet that they would not be able to tell the difference between Hi-Res / CD 44.1/16 or even 320kbps MP3. IMHO the one benefit to be obtained by using high resolution technology is the option to forgo resampling and process the 44.1 kHz from file to speaker. My Sony headphones support LDAC. If I use it the audio output switches to 96 kHz resampling rate, although I'd rather prefer to keep it at 44.1 kHz as my music files deliver that. Therefore I use SBC, which shouldn't be worse than the 320 kbps mp3 I mostly play. Do you think that's a sensible decision ? Or might I still reap some benefits from LDAC despite ( or because of ? ) having ( unnecessarily ? ) to upscale the sampling rate ? 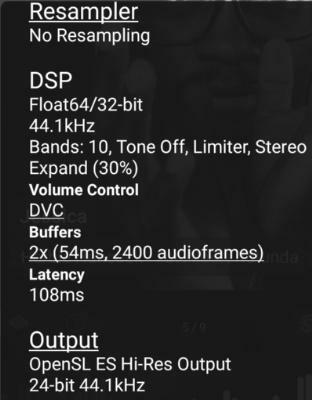 To be perfectly honest, in real-world application using moderate to good quality wireless headphones, streaming 320-bit MP3s from your phone, you’d be hard-pressed to actually hear any discernible difference from the same source fully wired while bypassing Bluetooth SBC compression completely. But there is a difference, and higher-end headphones may illuminate SBC’s limitations. And that's a great argument! It's also interesting that the high bit rate MP3's in the test were made from the same "inferior" 44.1khz/16bit (CD) files that were used for the lossless versions. Since MP3's by definition are (lossy) inferior to the original they are created from they should be even more inferior than the original. These type tests almost show that each level of higher resolution adds an increasing level of harshness that many perceive as inferior quality. With most current recordings being made with high sonic compression (loudness wars) we tend to loose even more dynamic range. This article is slightly OT to this, but again says there's not really much point to resolutions beyond 44.1khz/16bit other than to extract more money from your wallet. Any older music that's recorded on analog equipment will never be Hi-Res. Well that's a very dubious argument, from my point of view of course. If we are talking about old music and lossy/lossless format of course it'd better to have a lossless variant, because lossy formats still cut off a lot of information and you can't say for sure what is cut off. I heard the same opinion that it's wise to store the old music in the lossy formats, because "lossy format for lo-fi", however i consider the opposite, firstly as i mentioned before it's better to preserve the original source (tape or vinyl) in digital format with the help of lossless which gives more headroom or guarantee that nothing will be lost. Lossy can't assure that, because it's not his aim. Secondly it's an off topic but I store everything in FLAC, but listen in lossy for the sake of convenience, and because of that I can change lossy formats easily with converting them. Finally what I'm implying (that's why I've written alll the above) is that even Hi-res (16+/44.1+) can give some advancement: but, Firstly it'd rather be dependent upon the source, music, remaster or original (the issue with harshness) etc. And secondly it's likely that the advancement will be inaudible in most cases due to hearing or hardware limitations. P.S. harshness can be sometimes related not to Hi-Res, lossless issue but to equipment and production of the music. My issue is not with lossless vs lossy. It's the whole "hi-res" thing, the 96 - 192 - 384 / 24 bit (frequency / dynamic range). The original red book CD 44.1/16 bit goes beyond my hearing, and really anybody else other than those 2 audiophile guys that nobody really knows, but many say they are. If the mastering was done properly like Dark Side of the Moon or Long Road Out of Eden I don't believe there's any benefit (other than to get money from my wallet). For lossless (CD and beyond ripped to FLAC) I think if you use the same master and everything else is equal there would be no difference in the music regardless of whether it's 44.1/16 or all the way up to 384/24 other than how much you pay for it. Even if the original is digitally recorded at 384/24 and down sampled to 44.1/16 for Red Book CD. With todays tendency of some mastering engineers to play in the "loudness wars" the quality of the sound will be crap regardless of whether it's lossy, lossless (CD) or "hi-res". If we're speaking about people's hearing it's a very subjective field. Although I should admit that defined numbers or measures won't bring us much truth. We still listen to music with ears. From my experience I can say that if we're talking about a decent home audio system mp3 and FLAC can be relatively easy distinguished, also I did some test in the car with mp3 and aac, but it's another story. Yes, from the point of view of human senses it'd not be. For me Hi-Res can be just a gurantee to our inernal paranoid perfectionist. P.S. Mainly I download music so I don't pay for it. I recently did a frequency sweep test, and either my equipment is bad or my hearing tops out at around 16kHz anyway. 24-bit audio seems a good idea to me in term of processing headroom and fidelity, but anything much beyond 44k sampling (so 22kHz audio range) is going to be lost on me. Of course there's the argument that you lose the sine wave nature as you get closer to the sampling rate, turning very high frequencies into squares. It boils down to the question whether there is something more to deviations from sine waves than higher frequency sine waves. Fourier shows that there isn't, and as physics tends to be well dealt with by mathematics, that's OK for me. Meaning that if I can't hear frequencies above 16 kHz I also can't hear the deviations from 16 kHz.